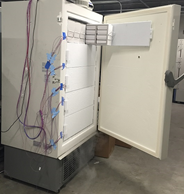 This ET project would validate the energy savings associated with Ultra Low Temperature (ULT) freezer systems. ULT freezer systems which normally operate at either -40°C or -85°C range; are a large or often the largest energy consuming equipment in university, hospital, and other commercial biotech laboratories. The project would conduct both lab-based as well as field-based testing and provide recommendations for energy efficient products in this category.